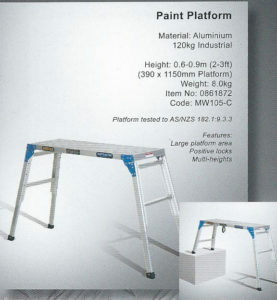 has an Industrial Duty Rating and Load Rating of 150kg. The tops are made of heavy gauge extruded aluminium, and the steps are connected with a solid double riveted construction. 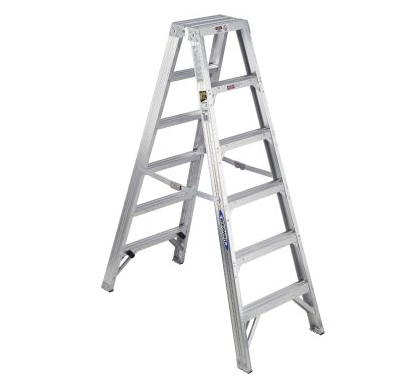 The extra wide TRACTION-TRED steps are slip resistant. The bottom steps are braced with full U channel knee braces. 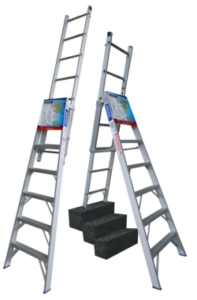 The WAKU Telescopic Ladder is adjustable rung by rung to almost double its height, and safely locked by four strong spring pins. Therefore one ladder replaces a complete range of step ladders of different heights. 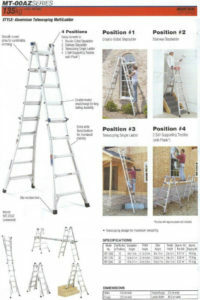 According to the type of work the user can always adjust the ladder to the most convenient height. 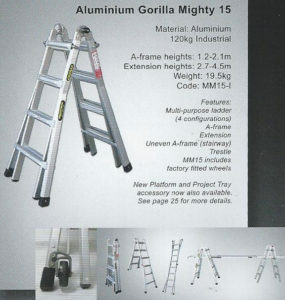 For transport the ladder is small and must only be extended to the required length when in use. The WAKU Telescopic ladder has an automatic safety hinge; by simply adjusting the automatic safety hinge the step ladder converts to a straight ladder, which can be extended rung by rung to almost four times its original transport size.